Mangaluru, despite being a part of Karnataka, feels like a distinct place in itself, thanks to the multiple cultures prevalent here. The cuisine, language, architecture, customs, and traditions are so markedly different from the surrounding regions, a visit to South Canara (now divided into Dakshina Kannada, Udupi and Kasargod districts) is imperative to catch the drift. Inevitably being a victim of time crunch on vacations, I chose places according to my convenience hoping to experience a blend of culture, landscape, wildlife and history. I hadn’t heard of this place earlier but instantly fell in love with it when I got here. Apart from giving you a glimpse of wildlife and vegetation, they’ve recreated a whole heritage village complex letting you experience an era bygone. A traditional manor model house of Dakshina Kannada called Guthu Mane occupies the centre of the village surrounded by typical towering areca and coconut palms. Decorated with slanting red Mangalorean tiles on the outside and lustrous red oxide flooring on the inside, they were painstakingly built to be a blend of pragmatic and aesthetic. Being a Mangalorean myself, these spacious and opulent red interiors reminded me so much of my own grandfather’s house, flooding back those patchy childhood memories of summer vacations. These Guthu houses symbolise grandeur and repose, and is the antithesis of today’s fast paced life. Sophisticated woodwork adds to the splendor, including several elaborately carved wooden pillars, apart from the cabinets, chests, tables and other furniture. A section of this model Guthu house is dedicated to traditional arts of the region. A unique theatre form, Yakshagana, is popular amongst people speaking the Dravidian language, Tulu, the prevalent language of the region. Typically performed during late evenings, they involve music, dance, drama, and dialogues by artists dressed in dazzling outfits, headdresses, and painted faces. 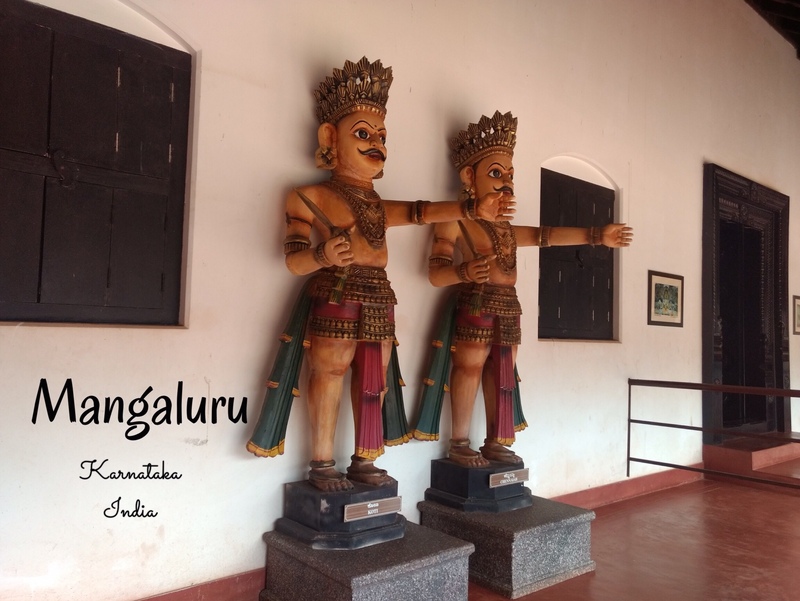 While in Mangaluru, a visit to this fort is definitely worth your time. Historically, Bekal was a crucial point for the then rulers of Tulu Nadu necessitating the construction of a fort to defend itself. It has passed through the hands of many emperors including Keladi Nayakas and Tipu Sultan. Bekal was a part of south Canara catering to many Tuluva families before the state of Kerala was formed. Majority of this vast fort is built along the shore and this vantage point offers a good view of the entire coastline. On our road trip from Bengaluru to Mangaluru via Chikmagaluru, we took a detour just to visit this temple. Built, in the 1338 A.D., entirely of stone and a unique amalgamation of the Hoysala and Dravidian architectural styles, it is chock-full of intricate detailed carvings of several deities, animals, ancient Puranic story depictions, and the twelve zodiac signs, both on the outside and the inside. The complexity of the details, that was so earnestly made, is more evident on taking a closer look. Bekal Fort is a 1 hr 45 min drive from Mangaluru (68 Kms) in a car or auto rickshaw. There are frequent local buses available from Mangaluru taking 2-3 hours. Entry costs Rs 5 for Indians and Rs 100 for foreign nationals. Pilikula is 10 Kms from the Mangaluru and takes 20 mins in a car or bike. City buses are available too but it’s much more convenient to have a two-wheeler to move around inside after you get there. It’s easier to pay for all the entries at once in the beginning rather than at each point. You can choose a suitable combination depending on what all you intend to do. I found the details here helpful. The Shringeri temple is 110 Kms (3hours) away from Mangaluru. There are no direct buses or trains from Mangaluru to Shringeri. Most convenient way is to hire a cab. Entry is free and you can check the Darshan timings here. Do let me know your thoughts or experiences in the comments section below! I think this place is very interesting especially from the architecture point of view- Guthu house is unique and so is this temple with lots of carving. Someday…..
memories…..loved to read about places I wandered…enjoy! great…you brought back so many of my memories…your pictures are great…keep travel blogging..sending love! Thanks a ton! Always great to hear such encouraging words. I’m so glad you liked it! Loved the house. These old style houses have a charm of its own. I had been to Sringeri long ago, and hope to go again. I am a temple carvings addict. Couldn’t photograph when i went, so hope to do so some day in future. Nice write up. Wow that’s quite a rare interest you got there. Good to know 🙂 Taking back photographs is definitely worth it, hope you visit again soon. I’ve been thinking of posting pictures from my visit to the temples in Halebeedu as well. Despite not being as big a fan as you, I must say I was spellbound. Will definitely look forward to that post. The Hoysala architechture is mesmerising. These are places that I am yet to go to, Belur and Halebedu. In case you are interested, you can take a look at my posts of some temples.